cabinet. Speaking of sewing, I went to Dover this afternoon. I bought 10 yards of Warm and Natural batting. It was half price. Then it broke the fabric reader, so the clerk had to write everything out by hand. Here’s what I bought. The stuff on the left is denim with a gold snakeskin design on it—-good for making “guy”containers. Now that certain men in my life have figured out that I can make covers for pretty much anything, I have to keep appropriate fabric handy. 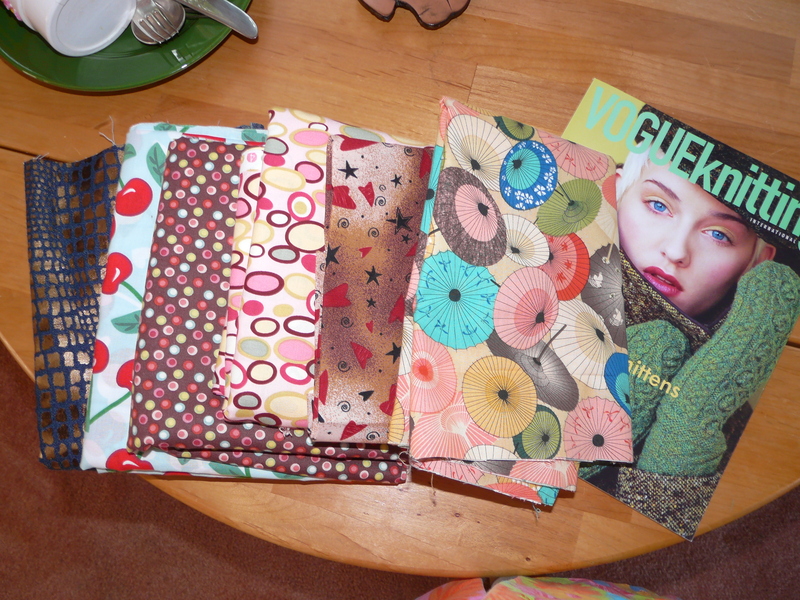 The cherries is going to be placemats and the rest is quilting projects. I buy Vogue Knitting once or twice a year. Whenever I subscribe, the magazine gets awful so I just pick one up occasionally. I did a little knitting. I got out some hand spun yarn I bought at MD Sheep & Wool about 15 years ago and made swatches. I am trying to decide which looks best. It’s 100% wool in a soft yellow, green, orange combination. I’ve looked at several patterns, but I haven’t settled on one thing yet. That’s the name of the next mystery quilt. I would like to start on it, but i have to finish Orange Crush first. I just can’t see having someones else do the quilting so I will do my best. It’s the only way that I can feel like it is truly mine. I am hoping to work on it in the few days. It was godawful humid today so the air went on mainly to make it bearable and I did a lot of housework. I want to go to Dover and do some shopping this weekend. There’s some things on sale that I have been wanting. 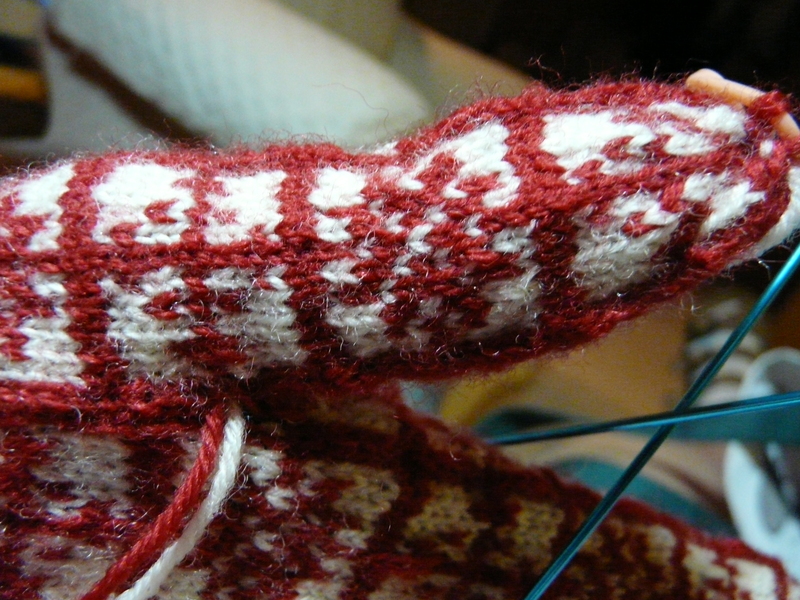 I haven’t been working on my knitting the past days. The middle finger is finished and I have started on the ring finger. So far, all three fingers are the same width. Has it changed? Or is it me? I used to like Dr Pepper. I’d get it when we stopped for fast food. Since I retired, I have plenty of time to cook so I hadn’t tasted it much in the last few years. A few weeks ago, we were out doing errands and I was rather tired so I stopped for burgers and I got Dr Pepper. It seemed weak, but I thought it was from all the ice. The other day, Doug picked up a case of Dr Pepper at the supermarket. He has always been a Dr Pepper fan. He said to try some. Even straight from the can, it did not have the burst of flavor that I have come to expect. It’s kind of—–boring. What happened? Be sure to get my good side. I decided to work on my quilt this afternoon. I needed to lay it out on the floor so I folded up my cutting table so I would have plenty of room and light. Zip took this as a sign for a photo op so here you are. Maude could have cared less. 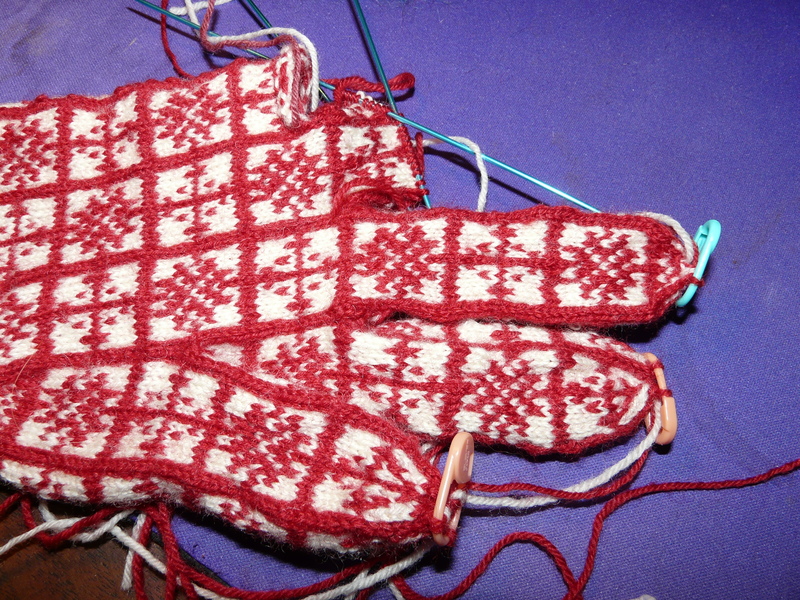 I forgot to take pictures of my gloves, not that I have gotten that much done on them anyway. I lived in Martinez, CA. It was a nice friendly little town. I liked living there. What I didn’t like was my husband. He made me crazy. So I took my two babies and came back to Baltimore. I went back once when my mother-in-law was dying of cancer. She told me I did the right thing. Her son was stupid. She made me feel so much better. I still think about her. She was always so nice to me. I was happy that she got a chance to see her grandchildren again. Sometimes, I think about the old couple who lived down the lane from us. You could not see the house unless you were standing out front. Mr had the whole yard planted with all kinds of vegetables and herbs and flowers. My back yard was planted with corn. Every morning, there would be a bucket of fresh vegetables on my porch. He took me around his yard and showed my where onions, garlic, peppers, herbs, etc, were stored. When I could I would go visit Mrs. I’d cut through the side yard trying not to step on anything including Mr who took his siesta on the ground. Mrs was in a wheelchair. She never told me why and I never asked. The house had no steps and all the doorways were wide. She said Mr built it that way for her. She would fix iced tea and usually had homemade cookies and I would talk about the babies. I really liked her. But the most memorable thing about her were her dogs. She had six or eight chihuahuas. They were hard to count and they were all the same honey color. And they were all very well trained. They did all kinds of things, not just tricks. They were helpful. They were fascinating. I went to the dentist this morning to get some work done on my lower plate. They took out the liner and put in a new one. Then, I went to the mall and got a haircut. The last haircut I had was awful. I went to a new place in town and I will never go back. I hate to have to drive 20 miles just to get a haircut, but what do you do? My hair looks good, but I still have a few inches of color in it. It’s not very gray and the color I used wasn’t dark so it really doesn’t look bad at all. It was about 1PM by then and I was really hungry. I got an orange smoothie and headed home. Along the way, I stopped at a roadside stand and bought blueberries, Lima beans and corn. Doug wanted hamburgers with mushrooms and onions in gravy, mashed potatoes and corn. I could never make this again and be perfectly happy, but he loves it so I make it occasionally. And I did have some nice ground sirloin. He ate three ears of corn and I had one. How does he do it? 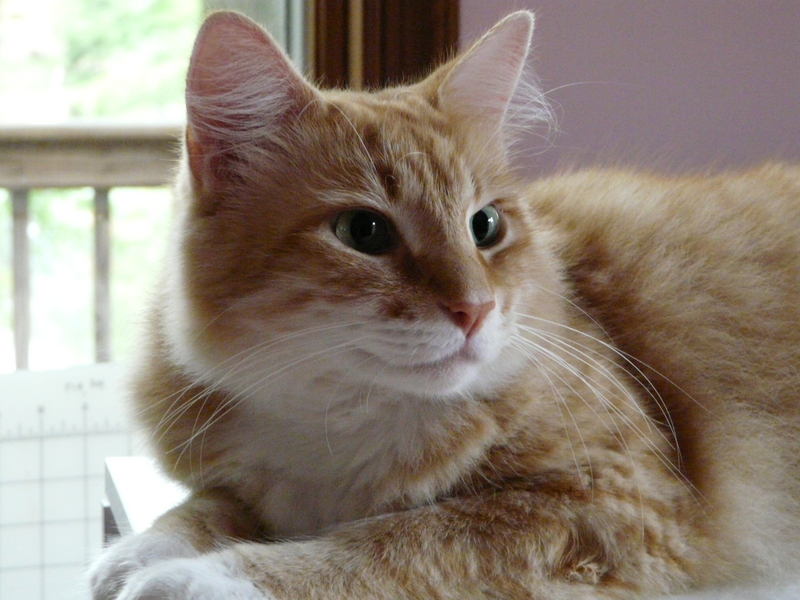 He just had a physical and blood work and all is well. I can’t eat like that. It’s disgusting! 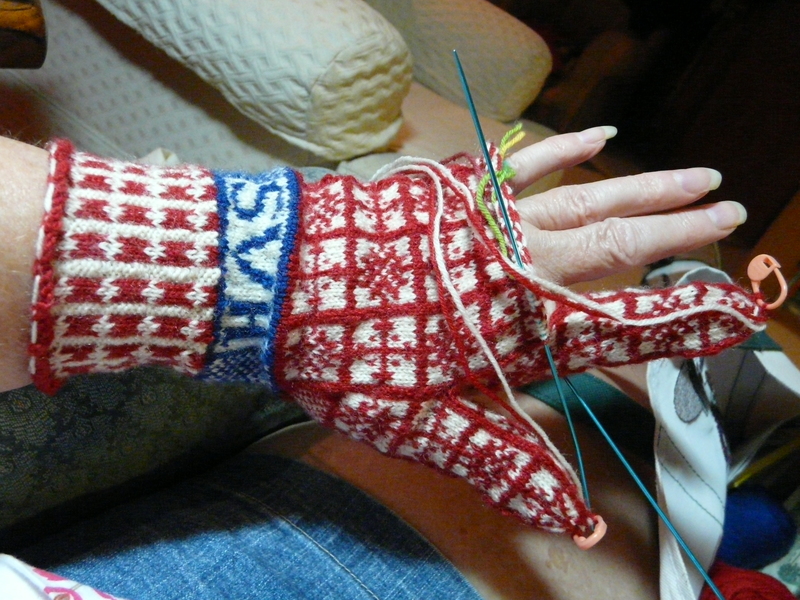 Here, I am just about to start on the middle finger of my gloves. I made the thumb shorter than it was supposed to be. It was too long. I worked on the finger at the dentist. It is the the same width as the first finger. It was easier to figure out this time. I know. I wasn’t in the mood. I wanted to get to bed early, but it didn’t happen. It got humidduring the night and we had to turn the air on this morning. Our morning walk was pretty awful and we were glad to get back. We’ve been spoiled by all the lovely weather. The index finger is finished except for the sewing. I prefer to only get my needle out when it is absolutely necessary. It was supposed to be three squares wide and high. That made it way too big. I like my gloves to fit. I do have gloves that are too big, but they go over my other gloves. I don’t do that much anymore because I don’t find myself standing around in the cold waiting for public transportation. I have nothing against it. It’s just that I no longer have to wait for the 0530AM train in the middle of winter. Yeah. OK. Let’s get back to the finger. It wound up being 2 and 2/3 squares wide. The third that is missing is not noticeable because it is on the inside by the middle finger. The directions also called for three complete squares high before starting the decrease. I started decreasing in the third row of blocks. 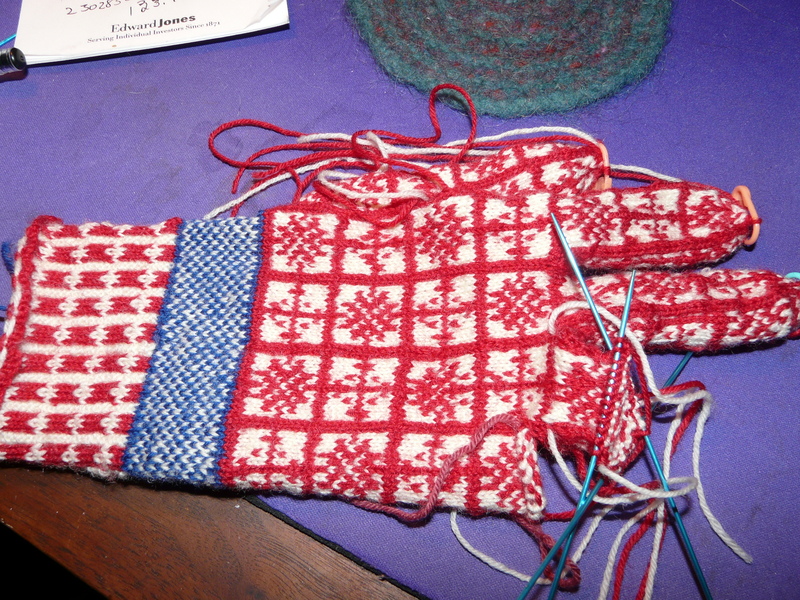 I decreased in the full ones and started decreasing in the 2/3 block when it had the same number of stitches. It turned out very well and fits perfectly. I have since started the thumb which was also too big so it is being redone. One of the nice things about gloves is mistakes are so little. I’ve been working on it, but they won’t listen. My knees were not happy today. As a matter of fact, they woke me up at 4:50 this morning. I didn’t walk very far either. At least it never got over 80 degrees and a very nice breeze came through all afternoon. I got the index finger on my gloves done, but I didn’t like it and tore it out. I started again and it looks much better. I’m glad I did it. I feel so much better today. I finally tackled the weedy mess on the other side of the garage. I am getting some Iris and Daffodil bulbs from Kevin in the fall and I want to put the Iris there. I found an old mostly dead rose bush so I cut it way back. We’ll see on that. I like roses, but not the thorns. There are also two ugly, prickly, little bushes that I think I will dig up. I didn’t get much knitting done and I didn’t take a picture. Well, I’m all worked up now. I just read about an increase in measles. Why? Why? Why? There is a wonderful vaccine out there people. Don’t you know what this disease can do? Do you know what it can do to your unborn child? How can you be so stupid? Come here. Let me knock some sense into you with this brick wall here! When I hear about crap like this Ijust get so upset. Stupid. Stupid. Stupid. But what do I know? I’m just an old woman. I do know one thing. If there had been a measles vaccine when I was young, I would be the mother of three live, healthy children, not two. OK. Here’s what you came to see. It was a great day and I got a fair amount done.